VANCOUVER, BC / ACCESSWIRE / March 20, 2019 / Ximen Mining Corp. (TSX.v: XIM) (FRA: 1XMA) (OTCQB:XXMMF) (the "Company" or "Ximen") is pleased to announce its Option Partner GGX Gold Corp (GGX: TSX.v), (GGXXF:OTCQB), (FRA:3SR2) has begun preparing for the spring 2019 diamond drilling program on the Gold Drop Property, located in Southern British Columbia. The program is scheduled to begin in early April. 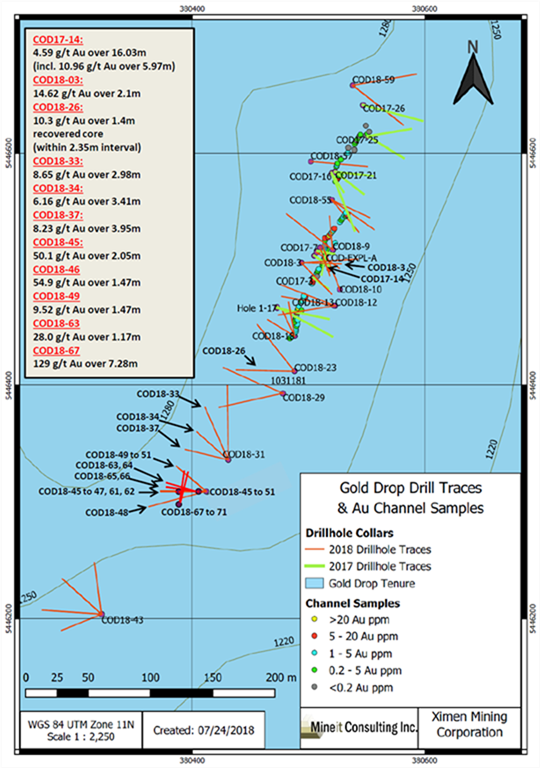 The spring drilling program will focus on the COD vein located in the Gold Drop Southwest Zone. The program will further test the southern extension of the COD vein. 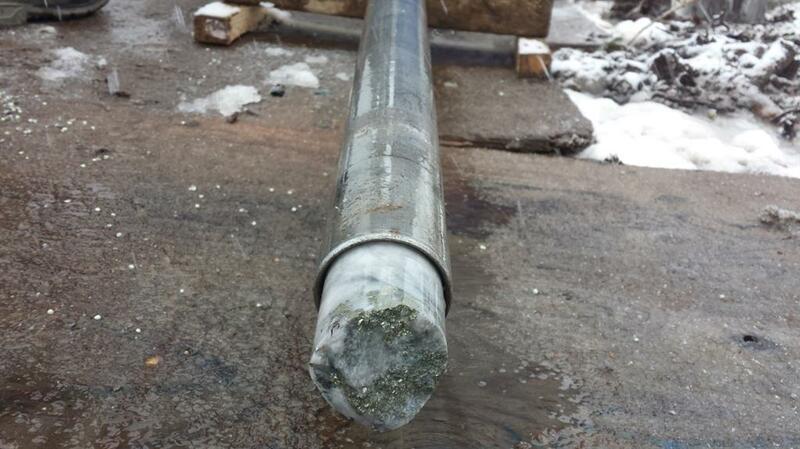 GGX intersected near-surface, high- grade gold, silver and tellurium in this part of the vein during 2018 diamond drilling. The highlights of the 2018 diamond drilling program are drill holes COD18-67 and COD18-70 that intersected near-surface, high-grade gold, silver and tellurium in the southern extension of the COD vein. COD18-67 intersected 129 grams per tonne (g/t) gold, 1154 g/t silver & 823 g/t tellurium over 7.28-meter core length while COD18-70 intersected 107 g/t gold, 880 g/t silver & 640 g/t tellurium over 6.90-meter core length (News Releases of January 11, January 18 and March 18, 2019). The COD vein system has been traced by trenching and diamond drilling for close to 400 meters along strike. The vein system is open along strike and at depth. Other targets in the Gold Drop Southwest Zone include the COD north region. No previous diamond drilling has been completed in this region. The 2018 trenching program exposed numerous vein showings with grab samples up to 15.45 g/t gold, 159 g/t silver Ag and 114.5 g/t tellurium. A chip sample (0.4 meters long) returned 21.7 g/t gold, 216 g/t silver and 149 g/t tellurium (News Release of February 27, 2019). Data from the previous exploration programs is currently under review to identify other specific exploration targets. Al Beaton, P.Eng., a Qualified Person as defined by NI 43-101 and director of Ximen Mining Corp., is responsible for the technical information contained in this News Release. 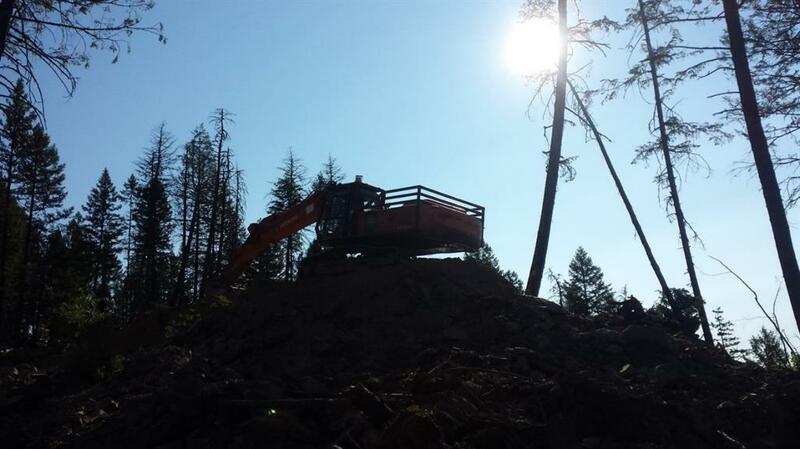 Ximen Mining Corp. owns 100 percent interest in all three of its precious metal projects located in southern BC. Ximen's two Gold projects are The Gold Drop Project and The Brett Epithermal Gold Project. Ximen also owns the Treasure Mountain Silver Project adjacent to the past-producing Huldra Silver Mine. Currently both the Gold Drop Project and the Treasure Mountain Silver Project are under option agreements. The option partners are making annual staged cash and stocks payments as well as funding the development of these projects. Ximen is a publicly listed company trading on the TSX Venture Exchange under the symbol XIM, in the USA under the symbol XXMMF, and in Frankfurt, Munich, and Berlin Stock Exchanges in Germany under the symbol 1XMA and WKN with the number as A2JBKL. This press release shall not constitute an offer to sell or the solicitation of an offer to buy any securities, nor shall there be any sale of securities in any state in the United States in which such offer, solicitation or sale would be unlawful. The securities referred to herein have not been and will not be registered under the United States Securities Act of 1933, as amended, and may not be offered or sold in the United States absent registration or an applicable exemption from registration requirements.